Sherlock Holmes had nothing on the dendochronologists. The complex science of fingerprinting is cast into the shade by a process which can track a piece of wood back through the millennia to identify the year it was felled. Every year, the tree grows a ring of bark. In years of a good climate the ring will be thick; in mean, spare years the ring will be thin. And scientists can track that. They build up profiles of the overlapping ring patterns from tree trunks using an eclectic range of sources: living trees, old buildings, archaeological sites and even peat bogs. One set of records at the University of Sheffield’s Dendochronology Lab can identify anything up to 5000 years old. Which is how scientists identified that the roof beams in the bishop’s private rooms in Farnham Castle, Surrey, were felled in the winter of 1380. The great black mediaeval nails left a deposit on the wood because when it was built into the roof, it was still green. They built a scissor-braced roof, a wonderful piece of mediaeval engineering which could span large spaces. You don’t find scissor-braced rooves around much these days. And it’s the same with hammer-beam rooves: a very distinctive shape, they held up big important rooves in the 14th century and there are few of them left. The king of them all resides at Westminster Hall. And the great ceiling timbers for Westminster Hall came from none other than Farnham Castle. Transport required ingenuity. The joists were taken across to the Thames and floated, on this super-highway of the time, up to London.Problem solved. Father Thames: an artery which joined huge swathes of South East England to its capital, and ultimately to the sea. Farnham is miles away from it; but other towns have capitalised mightily on their position on its banks. Like Marlow. The little town was in the right place at the right time: it lay, not only on the Thames, but on the main road from Reading to High Wycombe. And in a canny move, as far back at least as the 13th century, they built a bridge. The powers that be liked that. They granted Marlow a license to hold markets, and the town thrived. People from Marlow probably stood and marked the passing of those wooden beams from Farnham, making their way to London, one day in the 14th century. 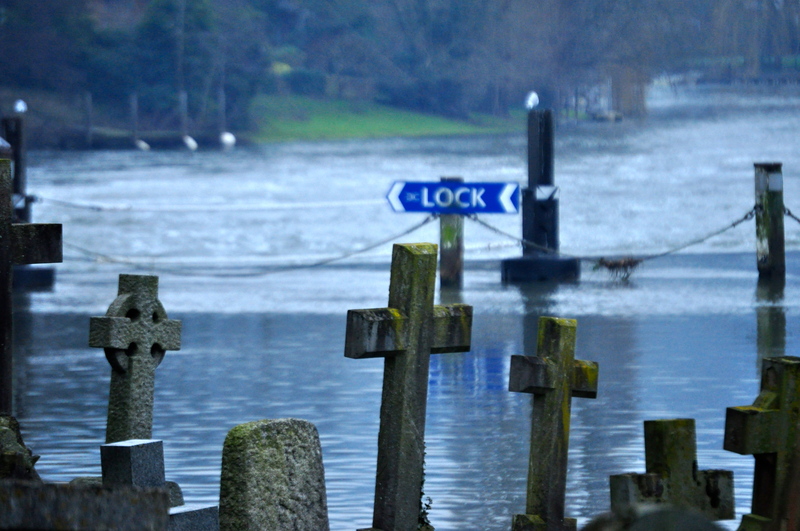 The Marlow townspeople built their town on the higher ground, further from the river banks. If they wanted to watch the passing traffic they needed to go down lower. And one of the best vantage points would have been the churchyard. The mediaeval church, and each church building since, has sat right next to the Thames; and were I a Marlow resident I cannot think of a more beautiful place to end my days than in the churchyard next to the Thames. Which is where I stood yesterday afternoon, for a few short minutes, underneath a snow-laden sky. The Thames flows on, regardless of time, regardless of the small dramas of our lives. I watched the waterway which had carried oak from Farnham to London, 633 years before I say down on the bench in the churchyard. And I expect people will watch the comings and goings of the Thames for many millennia more. Posted in UncategorizedTagged england, Farnham, Farnham Castle, history, Marlow, River Thames, Westminster HallBookmark the permalink. Grim and gothic, Jennifer, suitably grim and gothic. Must try the Prospect of Whitby. Wonder how it got its name? I hope I’ve inspired a post from you about the venerable Prospect, Kate. I was there this past June for a steak-and-kidney pie (comfort food). It used to be my home-away-from-home when I lived in London, so, many fond memories of the place (hanging not being one of them, thank goodness). And speaking of ring patterns to determine tree age, did you know that scientists can determine a shark’s age in the same way—from growth rings in its spine. I had no idea. Nature is clever, isn’t it? A very gentle post, as gently flowing as the Thames can sometimes be. Though I’m not sure I’d want to be anywhere near a river these days, what with saturated fields and flooded properties. My eyes boggled at ‘rooves’, but I find it’s OK if “rarely used these days, although it is still used in Australia”. It’s a bit like ‘dwarves’ versus ‘dwarfs’, the former preferred by Tolkien for Middle Earth purposes only but which I now find looks more correct than the latter. I see, after a little searching, that Marlow was referenced by Camden, who described it as “a prety town of no meane credite, taking name of the said chalke commonly termed Marle”. See what your posts do, Kate! On the web one thing inevitably leads me to another. My writing is nothing if not archaic, Chris 😀 Rooves suits me fine. It’s how I say it. I’m in the Tolkein camp, too. The web is a veritable miracle; one question leads to another. And on a snowy day that can be a blessing. Not only in Australia. Somehow, saying ‘roofs’ seems unnatural. They have always been ‘rooves’ to me, however spelt. After a couple of hours alternating between murmuring ‘rooves’ and ‘roofs’ I’ve decided that, indeed, I do say ‘rooves’ after all! It just looks strange; or maybe I’ve somehow imbibed an Americanism from too many action films, where the hero chases the villains across roofs (pronounced ‘ruffs’ perhaps?). I seem to have noticed that they more often go for a nasal, ‘Re-ewfs’ with that strange extension of certain syllables that many Americans use. Beautiful photos, Kate. Calming and cooling. You bring us glimpses of your explorations under snow-laden skies on one side if the world while we try to catch our breath in record-breaking heat on the other – 45.8 deg Celsius in Sydney today. What strange things the Thames has had floating upon it. Including me; though I wouldn’t like to do it in current currents or current temperatures! No. It’s not as comfortable as it is in the Summer, that’s for sure. That said, my friends had a Thames boating holiday booked for last July and it was cancelled because water levels were too high! Too low I can understand, but too high? Surely the more water to float on the better? I forgot about those! Which after having done the Hatton Flight inter alia, is very remiss. 😀 Not one of your most edifying memories, Roger, but you gave me a welcome chuckle. The very thought. Just inches away from all those posh frocks. Thanks, Fiona. Sometimes everything just comes together by itself. So much depends on bridging spans… be they under rooves, over rivers, or between ideas. Love this. Thanks, Cameron. Bridging spans, as you say, make the world go round. Tree ring research sounds fascinating. I am thinking in my mind how many different things you could look at that would determine tree ring growth. Micro-climates, high-ground vs. low-ground, density of a forest, type of tree, etc.. I have seen articles about how they have been able to determine the age of some musical instruments by looking at the grain patterns in the wood. Sharks are mentioned above, but there are also other animals where age can be determined by growth rings. Really fascinating. It is, Steven. Some of the dating of buildings that has gone on has really taken my breath away. I’d rather be a dendochronologist than an endocrinologist, which is how I first read your opening line, Kate. I needed to wipe the sleep from eyes and start again, which is a good thing as this was such a lovely, lovely post and music. Though nothing as dramatic as the Thames, I may just stop at our Salt Creek and watch the water flow today, which is balmy at 38°F. I loved these photos Kate. Think I’ve been right there one time. I love your blogs Kate. I am Australian but had a holiday home outside Marlow at Harleyford for many years. It inspired me to walk the Thames path with my partner, which in turn led me to write All Along the River;Tales from the Thames, to be released by Robert Hale in July. The river flows on and on … unmindful of our comings and goings. I love your observations, Kate. Thank you for sharing the beautiful tune.